Vito Capizzo led the Nantucket Whalers to nearly 300 wins during a storied coaching career. Legendary Nantucket football coach Vito Capizzo, who led the Whalers in decades of Island Cup rivalry games against the Vineyard, died May 17. He was 78. His death was announced on Facebook by his son Scott Capizzo. “He was a legend, a living legend,” former Vineyard football coach Don Herman said of his friend and longtime rival. 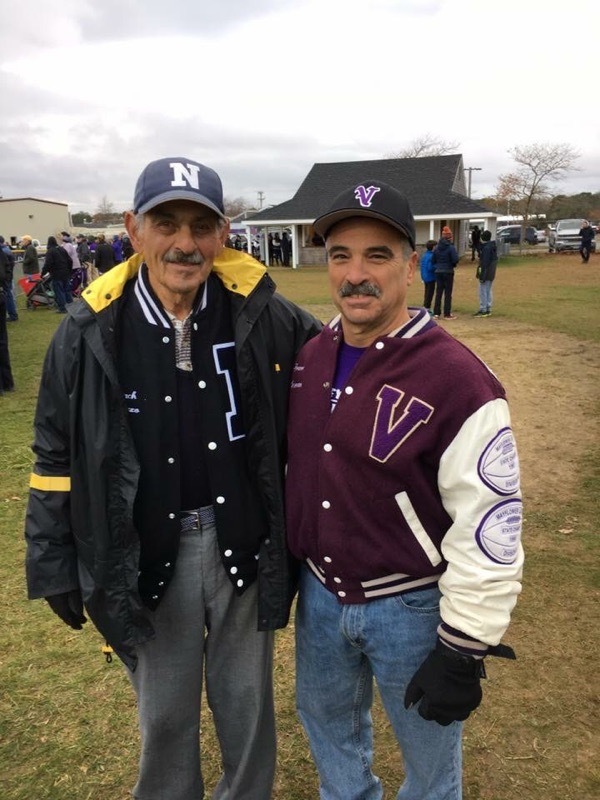 Mr. Capizzo coached the Nantucket high school team for 45 years and was one of the most successful football coaches in state history, retiring just seven wins shy of 300. Smoking his trademark pipe on the sidelines, he led Nantucket to nine appearances in the Super Bowl, including three championships. The team regularly defeated the Vineyard in the storied Island Cup rivalry game during the 1980s and 1990s. 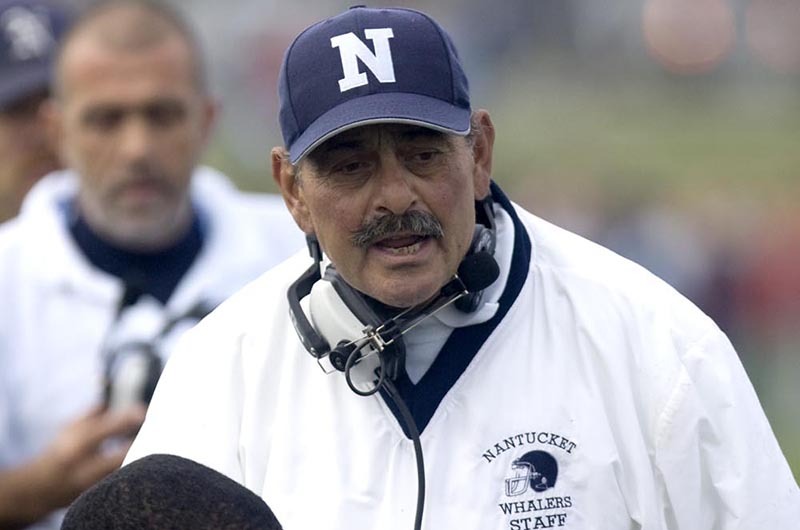 When he retired in 2009, Nantucket renamed its football field the Vito Capizzo Stadium. The coach that became synonymous with Nantucket football was born in Sicily, Italy. He was introduced to the game by his cousins when he moved to America at age 10. He graduated from Natick High School and was a walk-on for the University of Alabama Crimson Tide in 1959. He ended up becoming a protege of legendary Alabama football coach Paul (Bear) Bryant, and later mentored Joe Namath. In 1964 Mr. Capizzo came to Nantucket to serve as the head coach and athletic director at the island’s high school. In the beginning he coached all three Nantucket sports: football, basketball, and track. He ended up an Island institution, building up Nantucket’s football team into a powerhouse and growing the sports program to 17 varsity sports. But he never liked soccer, not least because it threatened to take athletes away from his football program. He credited a strict coaching style as a key to his teams’ success. “I tell the kids ‘You’re mine until Thanksgiving. Then you can go back to your parents.’ I run a dictatorship —a benevolent dictatorship,” he told the Gazette in 2006. Mr. Herman became the Vineyard head coach in 1988, and the two Island coaches guided their teams through years of storied rivalry games. “Vito and I, we had a really strong relationship that was forged over the rivalry,” Mr. Herman said Tuesday. During a trip to Newport, R.I. for a coaching clinic one year, Mr. Herman and his staff had a buffet breakfast at the hotel where all the football coaches were staying. When the bill came Mr. Herman asked the waitress to charge the meal to his room and gave her a number. When Mr. Herman’s last game as a coach was an Island Cup contest on Nantucket in 2015. Mr. Capizzo presented him with a plaque before the game, and Mr. Herman led his team to one last victory. The last time the coaches were together was in 2016 during an Island Cup game on the Vineyard. That time Nantucket won. Wall Street Journal reporter Jason Gay, who covered football for the Gazette starting in 1992, said Mr. Capizzo’s Whalers were a formidable rival for Mr. Herman’s decorated Vineyarders. Two days before his death, Mr. Capizzo welcomed a grandson that was named after him, Mr. Herman said. Nantucket struck early and often as it leads the Vineyard 29-0 at halftime.